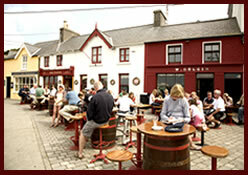 Bushes Bar is situated in the charming village of Baltimore on the south west coast of Ireland. Located in the middle of the Square, overlooking the harbour and islands where there is always a number of activities going on before your eyes. Look out and see boats sailing in the harbour, Fishing boats returning, Ferry Boats going to and from the islands, children swimming in the harbour and sometimes even seals swimming between the piers. One of the oldest Bars in Baltimore, Bushe's has always had a long and cherished maritime tradition. Visiting sailors and tourists to the south west coast of Ireland regularly make a point of stopping off in Bushe's (Baltimore) to partake in a drink or two while enjoying our renowned hospitality. Bushes Bar is family run and is now managed by Tom, Aidan and Marion who a few years ago took over the day to day running of the bar, from Richard and Eileen Bushe. If you haven't had a chance to visit Bushes in person as of yet, hopefully our web site will give you a taste of what is in store for you when you arrive. Friends and regular visitors to Bushes Bar have posted some comments and good wishes on our facebook page. You are welcome to read and browse through some of their comments and photos. If you would like to add your own comments or views, please do. The picture gallery includes some photographs sent to us from friends and visitors .... take a look inside .... you may recognise some familiar faces and friends ......or maybe even yourself!